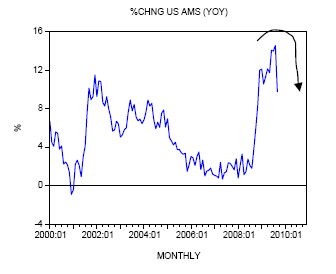 Is money supply soaring or not? If it is, to what extent? Once again this is the question many grapple with. The answer depends on the definition of money supply. The main difference between TMS and M Prime is the former includes savings accounts while the latter does not. For a complete review of the arguments from both sides as to whether to include savings accounts, please see What is Money and How Does One Measure It? I believe as does Austrian economist Frank Shostak, that savings accounts are really transfer of claim "lending accounts" and thus need to be excluded from monetary measurements. Others see it differently. See the above link for details. The problem with the above text clip is Shostak does not agree with the definition. 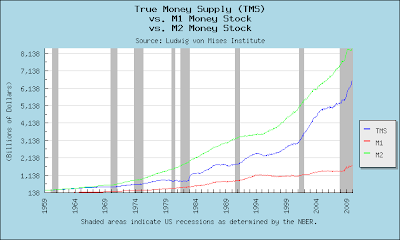 See Mystery of the Money Supply Definition in a Mises journal. Shostak settles on this definition: Money AMS = Cash + demand deposits with commercial banks and thrift institutions + government deposits with banks and the central bank. What Shostak is attempting to measure is money available on demand. I concur with Shostak in regards to excluding savings accounts. Think of it this way: Savings accounts are really lending accounts. You deposit money in a bank (transferring the claim on the money to the bank) in return for an agreed upon interest rate. Because the claim to the money was transferred, your money is not theoretically is not available on demand. Also note that there are no reserves on Savings accounts so it is highly likely the money was lent out. Furthermore, you cannot write checks against savings accounts (although some NOW accounts do allow limited check writing). Others argue that although the money is not theoretically available on demand, in practice it is. Thus the never-ending debate even among groups both professing to be “Austrian”. Note: That chart is as of November 2009, the latest I have. However, you can see M Prime follows the Money AMS definition. Be sure to match up the years. 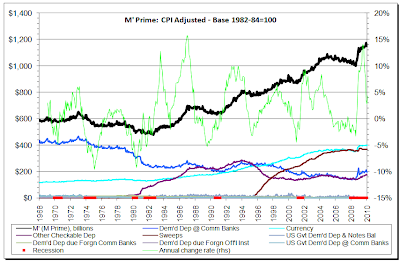 Money AMS starts in 2000, the M Prime chart below starts in 1968. Note that M Prime closely tracks M1 while TMS closely tracks M2. In fact, M Prime = M1 + Sweeps for all practical purposes. See What is Money and How Does One Measure It? for details as well as a definition of sweeps. By this measure, money supply is barely growing. The above M Prime Charts are thanks to "TC" who graphed them per my specs. Unfortunately the Mises site chart functionality for producing year over year % change in TMS is hopelessly broken and has been broken for years and I have notified them a half dozen times to no avail so I cannot produce a chart of year over year % change in TMS for comparison. However, the charts do show that M Prime has slowed while TMS has not. 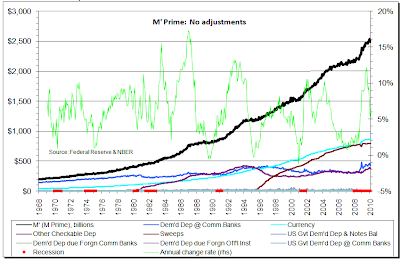 Both rose dramatically in 2009 signaling the Fed's liquidity measures, but M Prime now diverges from TMS. While attempting to find a chart of the %Change in TMS I stumbled upon a site that compared Money AMS with TMS as charted on Mises. 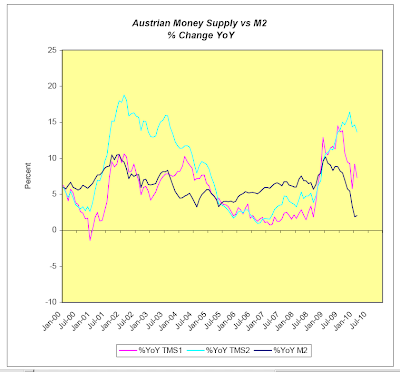 Please consider Contrarian Take: Austrian Money Supply by Michael Pollaro. There are tiny differences between the charts of TMS1, M Prime, and Money AMS but regardless of which one is perfect (if there even is such a thing). Michael Pollaro at Contrarian Take did a fantastic job with the charts. Pollaro has 9 pages of money supply charts that are well worth a look. 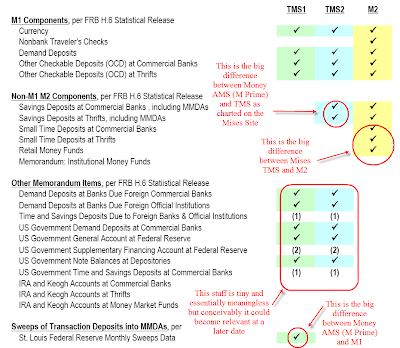 As a money supply measure, I am sticking with TMS1 or M Prime, both of which attempt to match Shostak's Money AMS.